SYRACUSE, N.Y.Scores of deer in Central New York will be tracked by satellite around the clock for a year in an effort to discover more about their habits and, in turn, learn more about the potential spread of chronic wasting disease, a highly contagious and unavoidably fatal neurological disorder. Researchers from the SUNY College of Environmental Science and Forestry (ESF) will fit the deer with collars that use a high-tech global positioning system to mark their locations every five hours for one year. "We'll get definitive information about the seasonal movements of deer," said Dr. William F. Porter, the principal investigator. "We'll have a very accurate location of the animal every five hours for a year. We'll learn precisely how they use the landscape for seasonal movements. We don't know a lot about whether highways are a barrier to them, whether they follow drainage systems or ignore them." Deciphering the patterns of deer movement should shed light on how disease spreads across geographic areas. The study results will also help wildlife managers learn more about controlling deer populations, and by extension, diseases like chronic wasting disease. "Their movement behavior should dictate how the disease is going to spread across the landscape," said Amy Dechen, a doctoral student from Ocean City, N.J., who is the project leader. Much of the work will be done by Dechen and Frank DeSantis Jr., a master's student from Gloversville, N.Y., who is also studying under Porter. They will begin trapping and collaring deer in January. "Locations that have more concentrated deer populations, such as areas with food sources or softwood cover during winter months, may facilitate a higher potential for disease spread," said DeSantis, who is exploring how migratory behavior might influence the spread of CWD. Porter said the researchers will probably work with deer in Oneida County, where five cases of the neurological illness have been reported in deer, and in Cortland County, which is, so far, free of CWD. In addition to the GPS units, the collars have VHF capability that enables the researchers to track animals through radio telemetry. Dechen said she and DeSantis will monitor the deer weekly, to make sure they are still healthy and that the collars are working properly. After a year, they will remove the collars from the first 50 deer and retrieve an electronic record of each deer's movements. Then another 50 deer will be collared and tracked for a year. 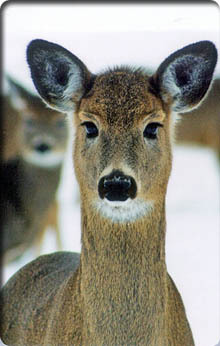 The location of each deer, at each point in time, will be recorded on a chip. The researchers will download the information into a computer, accessing a record that includes the deer's longitude and latitude, the altitude and temperature, and the time and date. The location coordinates can be plotted on a map using geographic information systems software. A goal is to use the information to make a computerized model predicting how disease is likely to spread through a population of animals and across geographic features. The researchers will be able to build computer models of the deer's seasonal movements and the way their movements react to features on the land, both natural and manmade. The use of GPS technology provides much more detailed and accurate information than the more labor-intensive radio telemetry traditionally used to track animals. White-tailed deer are the most widespread large mammal in the western hemisphere, ranging from Venezuela to Canada. There are an estimated one million deer in New York alone. Deer hunting provides big economic benefits in the Eastern United States. In New York, Porter said, the business generates about $800 million in spending every year. Hunters kill 250,000 deer a year, and between 100,000 and 150,000 animals are fatally injured in motor vehicle collisions. regeneration by devouring yellow birch and sugar maple trees, Porter said. CWD is also a problem in the west, where it began to appear among elk and deer in Colorado and Wyoming in the early to mid-1980s. The disease is now found west to Utah, north to Saskatchewan, and south to New Mexico. Earlier this year, five deertwo wild and three captivewere found to have the disease in New York?s Oneida County. Biologically, chronic wasting disease is similar to mad cow disease. It causes deteriorated body condition, dementia and confusion in affected animals and it is unavoidably fatal. Research indicates CWD is transmitted primarily between individual animals through contact with infected urine, feces and saliva. Studies also indicate transmission is possible through contact with an area contaminated by urine, feces and saliva, or the carcasses of infected animals. To date, there has never been a confirmed case of CWD in a human being. "For years, people thought humans couldn't get mad cow disease. Now we know it happens," Porter said. "This is a very similar disease agent among the deer population. And similar questions surround the bird flu. Can this affect humans? How? There are a lot of unknowns. And unknowns are reasons for concern. "No one knows what to do about it," he said. "No one knows how it's transmitted. We don't know how the behavior of the animals affect how quickly the disease is spread." The work is expected to be supported by funding from the N.Y. Department of Environmental Conservation (DEC) and McIntire-Stennis forest research program.